Foreign direct investment is "an investment made to acquire lasting interest in enterprises operating outside of the economy of the investor. [T]he investor´s purpose is to gain an effective voice in the management of the enterprise. ... Some degree of equity ownership is almost always considered to be associated with an effective voice in the management of an enterprise; the BPM5 [Balance of Payments Manual: Fifth Edition] suggests a threshold of 10 per cent of equity ownership to qualify an investor as a foreign direct investor." That's the definition of foreign direct investment from UNCTAD, which has published the World Investment Report 2017: Investment and the Digital Economy. This year's report includes the usual detailed overview of trends, along with some discussion of the evolving policy climate for foreign direct investment and the changing role of digital companies. Notice that FDI is explicitly separated from "portfolio investment," in which international investors buy stocks or bond or other financial assets across financial borders but without any management involvement. The usual believe is that FDI plays an important role in direct facilitation of international trade, and in the diffusion of technology and management expertise across borders, while portfolio investment plays a much smaller role in these areas. Here are some overall patterns. 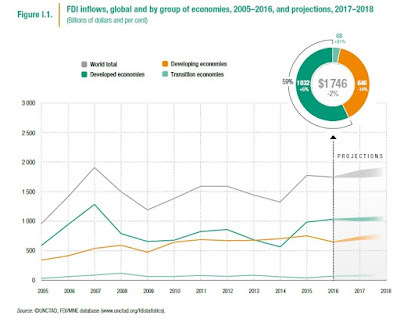 FDI peaked back in 2007, and the 2016 level of $1.8 trillion it had not yet surpassed that earlier level. 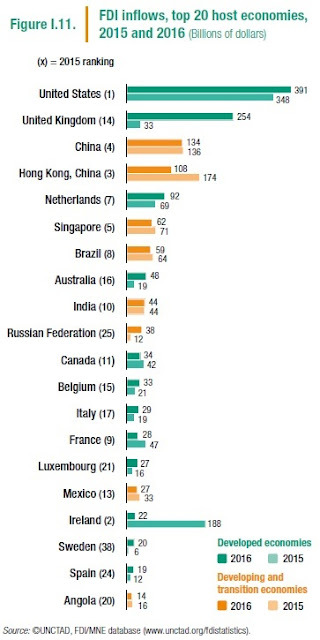 Most FDI inflows are to developed economies, although developing economies are not far behind. What are the major countries for FDI inflows and outflows? The US economy perhaps unsurprisingly tops both lists, but there are some eye-raisers as well. Here's the list for inflows of FDI. Three points catch my eye here. First, notice the huge drop-off in inflows to the UK in 2016, essentially matched by a large rise in inflows to Ireland. My suspicion is that this change is Brexit-related. Second, if one combines the inflows to China, Hong Kong, and Singapore--on the basis that they are all basically China-related--then inflows to the area of China are now essentially the same as those to the US economy. 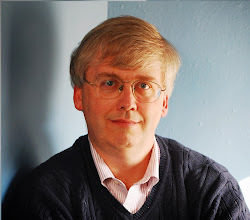 Third, a reason why the UK, Ireland, and Netherlands all rank so high, given that they are actually not large economies in the global context, probably involves ongoing relocations of corporate ownership across national borders: for example, perhaps a US company owns a substantial share of a firm in Netherlands, which in owns a substantial share of a firm based in a third country. Here's the corresponding figure for outflows of foreign direct investment. Again, the US and China lead the way. But overall, the high-income countries shown in green represent a greater share of FDI outflows than the emerging market countries shown in orange. We hear a lot about a globalizing world economy. So what explains why FDI has essentially been flat for a decade? At least some of the reasons seems to be that countries are becoming more skeptical about the potential merits of FDI, and are more likely to impose rules placing limits on foreign buyers if they fear that "strategic" assets might be held by foreign investors, that domestic workers might be laid off, and so on. UNCTAD does a count each year of changed in national investment policies, which are then broadly classified as tending to liberalize or to restrict FDI. Back in the 1990s, pretty much all the changes were on the "liberalization" side. 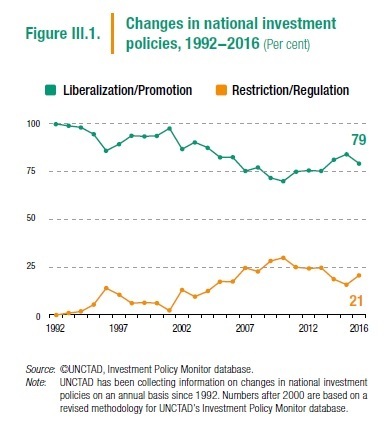 But starting in the early 2000s, the share of such changes involving "restriction" started rising, and is now about one-quarter of the changes in any given year. 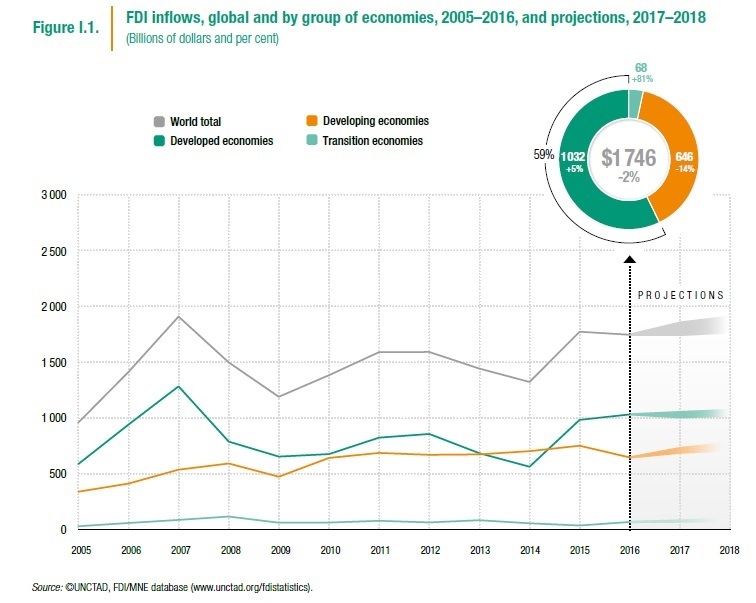 On the other side, the rising prominence of digital multinational enterprises has tended to support the level of FDI, and keep it at least flat rather than declining. UNCTAD makes a list of the top multinational enterprises, which are ranked according to the size of their foreign assets: that is, not according to their international sales, or their international visibility, but according to their level of foreign direct investment over time. Because of this method of ranking, as the report notes, "some well-known global digital giants, such as Amazon and Facebook, do not feature in the top 100. Neither do major telecom players, such as Verizon and AT&T, whose domestic assets and revenues are very large, but whose foreign businesses are relatively small." 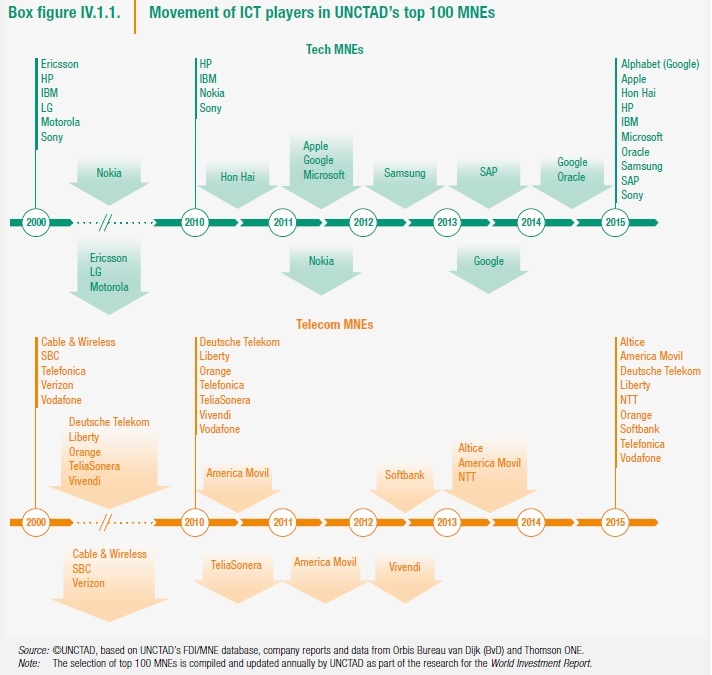 Thus, here's a picture of the tech and telecom companies in the UNCTAD top 100 list of multinational enterprises, and how the list has evolved in recent years. "The fast rise of tech MNEs [multinational enterprises] represents one of the most noteworthy trends in the world of global megacorporations in recent years. This phenomenon has attracted increasing attention, not only at the research and policy levels, but also in the broader public. In 2010, the relevance of tech companies in the top 100 MNE ranking compiled by UNCTAD was still limited and not significantly different than 10 years earlier. From 2010 to 2015, in contrast, the number of tech companies in the ranking more than doubled, from 4 to 10, and their share in total assets and operating revenues followed a similar, and even more pronounced, trend . This growing weight results from a group of tech MNEs, mainly from the United States, entering the ranking. Some of these companies, such as Alphabet (Google) and Microsoft, are leading the digital revolution; others, such as Oracle, heavily rely on and benefit from the acceleration of the internet to deliver their value proposition. When including telecom MNEs, other important enablers of the digital economy, 19 MNEs in the top 100 are ICT companies – a sizeable portion of megacorporations. Tech megacorporations are enjoying exceptional growth momentum." The statistics on foreign direct investment can be hard to disentangle, because ownership of foreign assets is an interconnected and overlapping network that can cross national borders multiple times. But the sheer magnitude of these flows--$1.8 trillion in FDI in 2016--compels attention.